Ret. USN Chief Petty Officer George W. Brady Jr. Celebrating the life of Ret. USN Chief Petty Officer George W. Brady Jr.
Be the first to share your favorite memory, photo or story of Ret. USN Chief Petty Officer George. This memorial page is dedicated for family, friends and future generations to celebrate the life of their loved one. Obituary for Ret. USN Chief Petty Officer George W. Brady Jr.
Ret. USN Chief Petty Officer George W. Brady Jr., of Peculiar, Missouri was born November 18, 1933 in Kansas City, Kansas the son of George Wallace and Verna (Cathel) Brady Sr. He departed this life on Sunday, August 5, 2018 surrounded by love and family at Foxwood Springs, Raymore, Missouri at the age of 84 years, 8 months and 18 days. On February 12, 1956, George was united in marriage to Mary Margaret Rupp in Kansas City, Missouri. George served in the United States Navy for 22 1/2 years where he retired as a Chief Petty Officer. He was a veteran of the Korean and Vietnam Wars. 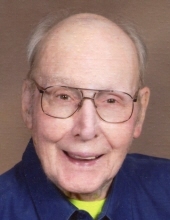 George was a member of Our Lady of Lourdes Catholic Church, Harrisonville, Missouri and a 4th degree in the Knights of Columbus. He loved all kinds of music and enjoyed singing in the church choir. George and Mary were members of the Smart Mohawks Camping Club and Hitchhiker Camping Club. George was a HAM radio operator with the call sign of N0DSF, a HO scale Model railroader and an avid Royals fan. Besides his parents, he was preceded in death by his wife Mary Brady on October 2, 2012; a son, Michael G. Brady on September 11, 2015; a infant son, Joseph Brady and a brother, Don Brady Sr.
George is survived by a son, James R. Brady and wife Angie, Greenwood, Missouri; three daughters, Margaret E. Humphreys and Kathleen C. Myers both of Peculiar, Missouri, Regina M. Lust, Pleasant Hill, Missouri; eight grandchildren, Matthew, Jessica and husband Armand, Sarah and husband Vic, Brett, Brandi, Jacob, Taylor, Austin; two great grandchildren; many nieces and nephews; other relatives and many friends. Funeral Mass was held Friday, August 10, 2018 at Our Lady of Lourdes Catholic Church, Harrisonville, Missouri. A Graveside service were held Friday, August 10, 2018 at the Mt. Olivet Cemetery, Kansas City, Missouri with Military Honors. Family suggests memorial contributions may be made to the Catholic Community Hospice. To plant a tree in memory of Ret. USN Chief Petty Officer George W. Brady Jr., please visit our Tribute Store. "Email Address" would like to share the life celebration of Ret. USN Chief Petty Officer George W. Brady Jr.. Click on the "link" to go to share a favorite memory or leave a condolence message for the family.